The Sinn U1-T features the same great case design made in-house from German submarine steel at Sinn's case making facility in Glashutte, Germany. Once the case is complete, the Tegimenting process begins, and when we say "fully Tegimented" we mean what we say - case, crown, bezel, case back and the stainless steel bracelet. The Sinn U1-T case is made from the same steel that is also used in the construction of the outer hull of submarines. The steel was procured by Sinn from a steel supplier to Emden GmbH, one of Germany's North Sea shipbuilding yards who construct submarines from the very same steel. Other features include sapphire crystal with anti-reflective coating, and metal stainless steel bracelet which is also hardened using the Tegiment process. Verified Owner Comments: Amazing build quality and the fully tegimented case and bracelet have a great color and finish and is much better in person compared to the photos. Additionally, the watch wears much smaller that one would think based on the dimensions. Overall, I am really happy wit the design, quality and appearance of the watch...plus it keeps good time (+/- 3 sec per day). Watchbuys was a pleasure to deal with and I will be back for more. "Sinn’s U1 is a winner!" Verified Owner Comments: I have been a wristwatch afficianado all of my life, though never a "serious” collector. The watches that grab my attention hard are tool watches. My criteria are: robust, accurate, easy to read, simple to operate, reasonably priced. The U1 hit every one of my criteria and more. I have thin wrists but this watch looks great on the bracelet and does not "wear” big at all. I find it very comfortable and eye catching. I have had many comments on this watch from "watch people” as well as normal people. I have the fully tegimented version which I have worn every day and night since purchase, in the field, in the office, in the boardroom, doing yard work and housework and it looks as good and mark-free as the day it arrived. The service from Watchbuys was fantastic and I could not ask for a more pleasant experience. I will be buying more Sinn products in the future. Verified Owner Comments: This is my first Sinn I am very pleased with the quality and engineering in this piece. The other reviews are full of detail I agree with them. I have been very impressed with Watchbuys throughout this purchase and particularly for John's assistance in coordinating shipment. A very satisfied customer. "Great Buy Would do it again!!!" Verified Owner Comments: Great Watch! I have owned many high end watches and this is built better than most of those out there. It also, is very unique styling and design make it a must have. Verified Owner Comments: Awesome watch. I polished case and bracelet to satin finish. The SINN really pops now. "More than I hoped for"
Verified Owner Comments: You worry about what it will look like and wear like because you only see it on-line. It was better than I thought. I love the watch more everyday. I was expecting the tegimented bracelet to be scratch proof, but that was not the case. The clasp is easy to scratch. I got over it quick because the watch excels every other expectations. It looks great on my 6.5 inch wrist and the watch steel color is an awesome blue-ish gray. It looks and feels well built and super strong. That's what I wanted. Verified Owner Comments: What a simple masterpiece. Stunning finishing levels. Singular dial and hands/markers. The industrial grey colour with the blasted finish look is very very cool. It's a keeper. And as this was my 1st transaction with WatchBuys, went perfectly including the importation requirements into Canada. Won't be my last Sinn. Verified Owner Comments: I can’t say enough things about his watch... I have never been a major fan of popular brands such as Rolex, Breitling, etc. I’m more of a fan of the not so well known brands producing quality pieces. I cannot tell you how much attention this watch has received by others. The guys who I dealt with at WatchBuys were all amazing, god knows I asked a ton of questions and they were always polite and willing to help! This is easily my favorite piece and only saw the watch winder to go to work, as I was afraid to damage it. Not sure why, I just like to take care of my nice toys, the TEGIMENT is amazing! Had a couple close calls where I thought I was going to look down and find a scratch or scuff, not a single mark!!! This is a serious watch that keeps great time (I’ll update with the +/- when I wear it for about a month. Overall, I could not be happier!! Verified Owner Comments: I've wanted one of these for years when I finally pulled the trigger, and it arrived at my door, I was moderately pleased to see that it was keeping a consistent +5sec/day (which is pretty good for a mechanical movement). That was about a month ago. Since then, it's settled down into just over 1sec/day (measured across the last 2 weeks). Absolutely phenomenal. 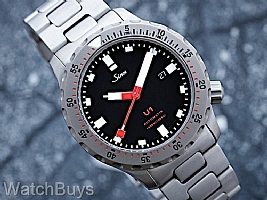 "Sinn U1 fully tegimented version"
Verified Owner Comments: I love everything about the watch. watch is -3+3 seconds a day I'm impressed with that. I can't take it off on my wrist. Satisfied. I'll definitely buy again to watchbuys just continue the great customer service. Thumbs up!. Verified Owner Comments: First, I'd like to thank the great customer service at Watchbuys! The Sinn U1-T is built like a Panzer tank! Great watch!!! Exceptional quality and great German engineering! I could not be happier! Verified Owner Comments: Watch is very nice looking. Very comfortable to wear. I really like the offset crown. Have several watches with the crown on the center and they really dig into my wrist. With the silicone strap it is not heavy at all. Definitely a watch that I will wear everyday. The staff at Watchbuys is very knowledgeable and the service is really great! Verified Owner Comments: After some research, I decided to buy a Sinn U1. So far, it has been an excellent watch for work, home, and play. I never have to worry about scratching the bezel or bracelet, and it wears very comfortably. I wouldn't hesitate to recommend this watch to anyone! "Best Watch money can buy in this budget"
"Sinn U1 Fully tegimented on Bracelet"
Verified Owner Comments: An extremely well engineered watch. simple in concept and a pleasure to wear. Very pleased to have acquired it. The tegimented bezel has a lovely soft touch. It is a bit of a standout compared with anything else with it's "Lego " face format. Which I must say does draw attention.Yes it has that "different"quality about it which appeals to me. "Great Watch; even cooler in person"
Verified Owner Comments: This is a great watch. It is built like a tank but even at 44 mm is not too big. If anything it wears smaller than the size. Removing links from the band is quite easy. Looks great and even better in person. Somehow, the simplicity of the watch face and the durability of the case and bracelet make this a very pleasant everyday watch. Also, the all tegimented version due to the unique look that you don't see a many other watches. Verified Owner Comments: I love this this watch. It's my go to watch when I need a grab and go. It's also one of my daily wearers for work. Since it's fully tegimented, I don't worry about accidentally bumping it. It's easy to read and has a no non-sense dial. This is my fifth U1-T. I sell them but just can't live without one. It's the one Sinn watch that any Sinn owner should have in their collection. "NOT built like a tank... please read on!" Verified Owner Comments: Couldn't be happier. Excellent watch that met every expectation I had regarding construction and "wearability". Lighter than expected and wears smaller than a watch of this size. Excellent service from WatchBuys and Sinn provided extra titanium spring bars at no charge after a simple email! Verified Owner Comments: Loved my first u1 from Watchbuys so much, had to order the fully tegimented version and I'm not disappointed. This one is slightly darker in color, love it's looks. Keeping spot on timing, plus 2 seconds per day or less. I switch back snd forth between u1's and all my other timepieces just sit. This is also the only watch I've owned where I have received comments....about it's uniqueness and attractiveness. Bottom line, if you are on the fence regarding purchasing the U1, just do it. Forgot to add, exemplary service and follow up from Watchbuys. Verified Owner Comments: The Sinn U1-T is all I hoped it would be: obvious build quality; well thought out design/features; German precision; an easy to use tool. And it is several things I did not expect: very easy to wear for a 44mm, thick watch (I have average to smallish wrists yet it does not seem clunky or too heavy); and stylish in a manly way, sort of in a "so ugly it's beautiful" way. Let's face it, the dial is a face only a mother could love, and yet it makes the watch so distinctive, and so easy to read, it ends up capturing your heart. Watchbuys throughout the purchase process demonstrated their commitment to customer SERVICE, too often these days a lost art. Very happy to have the Sinn U1-T to add to my ancient Rolex, several Panarais and a Chronoswiss Ghost...all of which may now prove redundant as I wear the Sinn as my everyday watch. Verified Owner Comments: I love this watch. It sits proudly with my collection of Rolex's, Patek's, AP's, etc. It is comfortable, heavy (210 grams with the steel bracelet), easy to read the time (The date is not so easy to see), and comfortable. I have relatively small wrists but the watch looks great. It wears small for its size. Best of all, it is built better than a brick s house. One watch I truly am not afraid to wear in the shower, ocean, or out on Saturday night. Verified Owner Comments: I must say I'm very impressed in this Sinn U1-T, especially considering it's relatively low price compared to some of the other watches I've owned. It features great steel, crystal with AR coating, a great bracelet and a vey accurate movement. I couldn't ask for more for the money! Verified Owner Comments: My U1 T is a favorite in my collection. To me, it is the iconic Sinn watch. Verified Owner Comments: Really like this watch. Very high quality. After wearing Panerai's my 356 felt a bit small. Sold it and purchased this. Very happy with the U1 T.
Verified Owner Comments: The U1-T is just what I was expecting. Super tough and it looks even better on the wrist than it does in pictures! Verified Owner Comments: Sinn watches are about application of technology to achieve a functional goal. This watch is all about the surface hardness, corrosion resistance of its materials of construction with a clear, communicative dial. The Sinn U1-T is a simple, rugged variant of a well regarded tool watch. The design of the U1 is a classic Bauhaus style watch with functional, fit-for-purpose diving features. For example, the chromatic red indices on the bezel will look gray due to wavelength filtration >15' (5 m) beneath the surface leaving the essential markings (last 15 minutes) in black to stand out. Verified Owner Comments: I just like everything about this watch. The fit, feel and overall look does it for me. It is extremely well built and can be used for casual or dressed occasions. I have had plenty of compliments on this watch and would definitely recommend it to anyone. Kudos to Sinn on this one! Verified Owner Comments: This is an amazing watch. A little on the hefty side but that doesn't detract from its character. When you wear it you feel it and others generally notice it. If the calender were perpetual you could probably wear it until the end of time. I encourage people to NOT buy the fully tegimented U1 to keep resale and collector value high. Verified Owner Comments: I recently added the Sinn U1-T to my collection and could not be happier. Initially I was unsure the Bauhaus inspired styling would be to my liking, but in short order it has grown on me. The metal work quality and fit and finish is outstanding; as good as any in my collection including my Rolex and Breitlings. The service I received from WatchBuys was outstanding. The watch was in my hands in Calgary, Canada less than 18 hours after the order. I will certainly purchase from them in the future. Love the darker gray color and how everything matches, bracelet, bezel, case etc. They also have placed the Tegimented symbol on the case, case back, and clasp. I would buy one ASAP before there all gone.